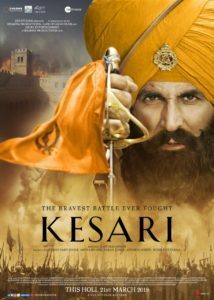 “The bravest battle ever fought” proclaims the poster of the new film Kesari. Described as an action-war film, this depicts the battle of Saragarhi in which 21 Sikh warriors fought 10,000 Afghans in 1897. And when you have Karan Johar, Anurag Singh, Akshay Kumar and Parineeti Chopra already this feels like an epic. However, that puts more pressure on the music as all these individuals are known for great songs as part of their showcase reel. So Taniskh Bagchi leads an army of the finest young talent with Arko Pravo Mukherjee, Chirantan Bhatt, Jasbir Jassi, Gurmoh and Jasleen Royal all bringing their skills to this album. Jasbir Jassi opens the album with the most fundamental of Sikh ideals, Ik Onkaar. This is a known religious tenet of Sikh religious philosophy so it must be treated with the upmost respect. Also being a basis of religious thought, its words must be very clear so that a listener may take the chance to feel god in his/her presence. There is a chorus behind and a very loud bell to separate the words and nothing else; the stillness in the piece is marked. Even though its only a minute long, there is plenty of time to reflect upon its base meaning. The next song, Ve Maahi, shows off the way culture crosses borders without care or worry for anything. This is clearly an Afghani based tune with sarod and rabab providing backdrop to a smooth love song as is expected by Arijit Singh and Asees Kaur. Yet, enough synth is employed to bring it across to the Indian side as by about half way through, the song has smoothly shifted into sheenai and a male chorus, for what sounds like a wedding scene. While the next song is titled Teri Mitti (your land), it is essentially the title track of this film. Keeping in mind that Kesari refers to the saffron colour that colours their turbans, which is extracted from the plants of Punjab this makes perfect sense. Also being a call to the land upon which these plants grow, it is a passionate cry out to the people of that land from the 21 preparing to battle for their freedoms. B Praak proves to be the perfect singer for this as his voice carries the song from top to tail. There is a piano and violin backdrop but they are only a value added extra. From the serious to the fun, the next song is Sanu Kehndi. Romy and Brijesh Shandilya did not take this song on their voices alone, with a lot of traditional Punjabi instruments evening up the balance here. Relatively short but definitely enough time for bhangra to break out in all the hallways. However, as a song its fairly generic as this song could be a festival or even a party within a home; an ideal candidate for a club remix to bring it to all the dance floors. On the dunes of the desert, comes the Singh army bringing all their swagger and confidence into a situation replicated in Hollywood gang movies of the 90s in Ajj Singh Garjega. The tune will be instantly familiar to 90s western rap fans or Punjabis as Jazzy B tries desperately to cram in the new lyrics into an old song. Jazzy himself doesn’t seem to have been the best choice for singer here as his voice is stretched beyond recognition. The album is completed by a male and female rendition of Deh Shiva. Sukhwinder Singh and Jasleen Royal in separate songs call to Shiva to give strength and courage “Na daro harso jab jaye laro”. Jasleen’s version seems to be more like a childhood verse learnt by children to keep in their hearts for the challenges to come while Sukhwinder is the full-grown adult using the power of the tune and the words to psych themselves up to bring home victory. Either way it’s a powerful standing message of “we will not back down, we didn’t come here to lose”. This completes a well-rounded album in the classic Bollywood style. For those who remember war films starting from Border in 1997, there are no surprises in this album. But it’s important to recognise that the music that this album provides is nothing more than a backdrop to the scene its based on. Of course, ‘Ve Maahi’ as the token pure love song will be separated in some form from the rest of the movie e.g. a dream sequence or a flashback but the rest will be in the movie’s real-time and are supposed to be the brass knuckles on the punch delivered by the story. All of the musicians being Punjabi themselves is an aid here as there are no major shifts in tone but considering some of the weaknesses highlighted earlier, would the punch be a full knockout?